This is an extremely successful combination. Who is better than Taurus, who plays the role of creator in the zodiac, awakens inner confidence in Cancer? Their relationship is full of love, and Cancer likes to be loved and pampered. Psychologically inclined to struggle with arrows and stones of fate, Cancer slowly learns to leave his shell. It is also important to remember that Taurus is a sign of the earth, it stands firmly on its feet, and Cancer, as a sign of water, emotionally reacts to life. Taurus sometimes it is difficult to understand that even the satisfaction of all practical needs will not replace the internal confidence of other signs. Sometimes Taurus should look around and see not only what is happening right in front of them - especially when their child was born under the sign of Cancer. In order to truly understand Cancer, one must be able to look into his soul. This conveniently arranged couple really enjoys each other’s company. Little Cancer adores the comfort that his Taurus mom created, and feels safe, feeling her warmth and attention. The mother is happy that her child respects what is dear to her, helps to take care of her dear home and enjoys her delicious cuisine. Taurus always places a shoulder so that the child can cry on it if it has a bad mood. For all its outward noise, this mother looks attentively at the feelings of little Cancer and knows when to scold him, and when to pamper. She realizes that life sometimes seems for Cancer to be something of a struggle, and then he needs comfort and support. She understands and fluctuations in the mood of the child, because it happens to her. And she is always ready to help him and a joke, and gentle participation. They quarrel not so often, but if this happens, Taurus mother for a long time plunges into a gloomy mood. 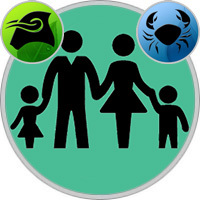 Cancer will try to distract her lovingly, but the Taurus are so stubborn that they can be angry for a long time, although the quarrel is long behind. Mother is even more serious about money than her thrifty child-Cancer. Taurus appreciates the money that they can buy, they give it a sense of well-being, the opportunity to have beautiful things that give pleasure. For Cancer, the mother is the main source of well-being, and since he is very affectionate, it will not be easy for him to gain self-confidence. But Taurus does not object to this. She loves that her children behave like children, and does not expect from them independence until they themselves declare it. Cancer is very happy that the mother shares his love for home. True, he himself is capable of something more, and Taurus should not underestimate the capabilities of his child. The mother must find for him such an activity, which would enthrall him more and more. Of course, Cancer needs encouragement, but Mom-Taurus understands that praise to him is only beneficial. They like to share small secrets and exchange jokes, try to calm and support each other, if one of them did or said something that hurt others. Mothers are pleased to realize that her little Cancer can be a real friend for her. And Cancer feels that he received just such a mother, which he would like to have, because she is always there and with her he feels loved and protected. Kindhearted Taurus is ready for anything for his beloved little Cancer. Well, who else will be able to share his love for home comfort and peace? In addition, Cancer is happy to help his father when he is engaged in small repairs at home or in a garden - he really enjoys being useful. And yet Cancer likes a cozy house, created thanks to the efforts of his father and the money he earned. He knows that behind him is always the father, encouraging him, helping to develop strength, perseverance and determination. The father can give him confidence and show how to achieve success without being too judgmental, if for some reason it does not work out. But Taurus can be very strict, especially if it seems to him that he is losing control of his child. And with a small Cancer you can not be too harsh! He is already scolding himself, even if nothing special has been said, and begins to worry, not receiving approval. Taurus himself is gloomy, but with Cancer he can not be compared… So, follow this, try to persuade the child in time, and then everything will be all right again. Like Taurus, Cancer considers food to be a serious matter. And if he is concerned about something, he may either lose his appetite, or be too carried away. Try to have the house recognized healthy food without "pieces" or endless sweets. Over time, Cancer will remember with gratitude how much his father gave him. Still, it is happiness - to grow up in an atmosphere of calm and order in the warm and prosperous house of Taurus!